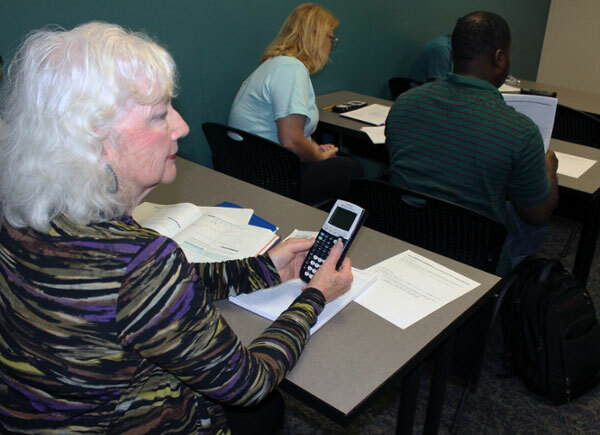 Margaret Wallace listens to her professor, Dr. Barry Monk, in the last class she needs before graduating, Math Modeling. As a practical matter, Margaret Wallace didn't "need" a college degree. Better known around these parts as Margaret Snow, her name adorned many a real-estate sign during a successful, decades-long career as an agent and broker. About 10 years ago, shortly before she turned 60, she became a compliance investigator with the Georgia Real Estate Commission, a job she holds to this day. But her lack of a degree gnawed at her. It was the box she couldn't check on a form, the bucket-list item she couldn't cross off. That changes this fall, when the Macon native is scheduled to receive her associate's degree in criminal justice from Middle Georgia State University. She has already accumulated about another year's worth of course credit toward a bachelor's degree, which she will continue to pursue after participating in MGA's fall 2018 graduation ceremonies on December 13. Two weeks later, on New Year's Eve, she will celebrate her 70th birthday. "Earning a degree is just something I always wanted to do," said Wallace, who returned to using her birth name several years ago. "At my age, there were times when it was tempting to think 'Why?' What can you say to that except, 'Why not?'" Many Middle Georgia State faculty and staff members - too many to name them all here - have cheered Wallace's journey toward a degree and encouraged her every step of the way. Laura Terrell, assistant director of Admissions and Recruiting, got to know Wallace well as she helped her sort through the logistics of transcripts, transfer credit and the tuition and fee waiver the state of Georgia offers to citizens age 62 and older. "She's so inspirational," said Terrell, who works with students of all ages but acknowledged the relative rarity of one in her late 60s who wants to earn a degree. "It wasn't always easy for her to keep going, but she was determined. She's a great role model for others who may not realize that Georgia has a tuition-waiver program for senior adults. I know she made friends with some of the traditional-age students in her classes. They looked up to her as a surrogate mom or grandmother. They helped her and she helped them." Wallace did go to college after graduating from Mount de Sales Academy in 1966. But a bout of pneumonia forced her return to Macon from what is now Georgia Southern University. For one reason or another, she never made it back to Statesboro. She worked at a Macon bank for a while but her parents encouraged Wallace, the youngest of their three children, to give college another try. So she enrolled at a small private college in Cuthbert in southwest Georgia, where she completed a full year. But Wallace again put higher education on the back shelf when she got a good job offer as an insurance claims investigator. At age 24, with her 4-year-old daughter Shelley in tow, Wallace took the advice of a friend and got a real estate license. That was the beginning of a 33-year career that some might say Wallace was born to do (and one that helped her put her own child through college). Legions of people in Macon and the surrounding area either bought or sold a home with Wallace's help or know folks who did. "It was a wonderful career," she said. "But even while I was working in real estate I took classes here and there, starting at the old Macon College. I loved it, but real estate hours are so irregular that it was hard for me to actually finish a degree." Once she joined the Georgia Real Estate Commission as an investigator, her hours became more predictable. Wallace decided to resume her long, slow trek toward a degree, this time at what was soon to become Middle Georgia State University, created through the consolidation of the former Macon State and Middle Georgia colleges. Wallace was delighted to find people at Middle Georgia State who worked to make sure that much of her previous college credit, even from classes she took decades ago at other institutions, would apply toward her MGA degree. She chose criminal justice as her major because she thought it would help her in her current job. Her renewed pursuit of the elusive degree still came with challenges. While she loved all of her criminal justice courses, she struggled in others, especially biology. Wallace admits to feeling conspicuous when she took an early morning class one semester at the Warner Robins Campus. Every one of her classmates in that particular course were students right out of high school, which made her overly conscious of her age. When possible, she stuck to afternoon or evening classes, where typically there are diverse mixes of younger and older students. Some classes she took were fully online. With her 'never-met-a-stranger' personality, Wallace has many friends and lots of opportunities to socialize. But her study schedule required that sacrifices be made. "I missed some good parties," she sighed. There were many high points, too. One of the younger classmates she befriended helped Wallace survive biology and told her she was honored to have her as a lab partner. And Wallace credits Jeffrey Tarver, assistant professor of criminal justice, with encouraging her to work toward an associate's as her initial degree. Especially for non-traditional students, earning an associate's degree is a significant milestone represented by a tangible object - a framed diploma - that graduates can use for career advancement or as a motivating force to continue on to a bachelor's. "My bosses at work have encouraged me and fully support me," Wallace said. "Working toward this goal has helped me in so many ways. My thinking and reasoning skills have improved. I feel like I'm better at managing my time. Now I can see the end and I'll finally be able to say on my resume that I have a degree." Ask Wallace what kept her going as she chased her coveted degree, she talks of family members - her daughter, her son-in-law, Danny (both college graduates), and her three grandchildren - Ben, Sarah, and Jake. She mentions her gratitude for loved ones who lived long and the enduring grief over those gone too soon. Her mother lived to be almost 100 and died just a few years ago. Wallace's nephews, Brax and Tate Bragg, were killed in a car accident in 1999. Brax was 28 when he died, Tate just 17. The musical brothers were the inspiration for what has become the region's largest annual music festival, Bragg Jam. "My mother's long life helped me realize that I could very well have a lot more life to live and have time to benefit from finishing college," Wallace said. "We can't know how long we have, of course, but we still owe it to ourselves to try to get as much out of life as we can. That's what I'm trying to do." Editor's Note: Under University System of Georgia policy, citizens age 62 and older can enroll in state colleges or universities without paying most fees. Some pursue degrees, many take courses for personal enrichment. Restrictions apply. For more information about this policy, visit https://www.mga.edu/bursar/waivers.php.